For some reason when I go there it says there is nothing there. There is an English broadcast for each game. However, the Habs' site doesn't bother to show most of them and that's where Del pulls the info from. Interesting. Seems like the official Habs site has become quite anti-English lately. In addition to them not listing most of the English broadcasts, I've noticed that going to www.canadiens.com takes you directly to the French version now, rather than giving the option. I've been dreading the day the team site goes to the NHL's new format, and it's even worse than I was expecting! I know this comes up every year but it's never been an issue for me; what's the best way to catch all the games in the USA? Does it simply depend on my provider? I could stream on my laptop but in willing to spend some money to order a channel on television if need be. If you don't want to stream the games, then Center Ice is your only option. I only ever used that service once, the year the Habs had their worst season and my buddy's cable provider accidentally gave it to him for free. So that was a few years ago now, but I wasn't impressed. It only carried one game per time slot in HD and I don't think it was ever the Habs game. The last few years I went with the streaming option, GameCenter Live, now NHLtv. Overall, I found it to be a much better service. Every game was in HD and it gives you access to an archive of old games. Games that are blacked out because they are on NHL Network are viewable 48 hours after the game ends, so you can even catch the games that don't air live. It also lets you pay less if you only want access to one team's games. Espcially if you have a streaming device hooked up to your TV (Roku, Apple, Sony smart devices, Playstation, Xbox), it is an excellent option. Thanks. I recently purchased an Xbox One S so I'll definitely check out the GameCenter option. Appreciate the suggestion as well, Stogey. Forgot another benefit of the streaming option - your choice of feed. Oponent, English, or French. Center Ice was only ever the Canadian feed if it was against another Canadian team. 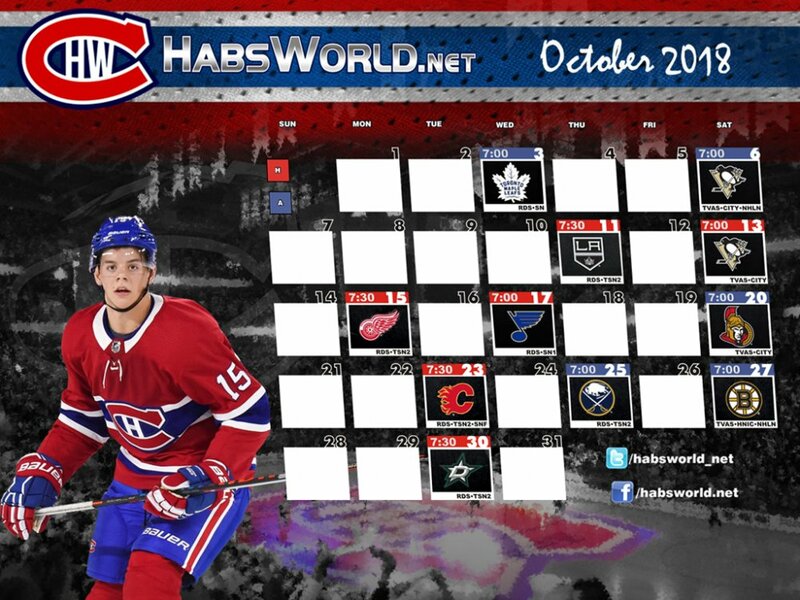 Del updated the calendars with the rest of the English TV channel information that the Habs' site conveniently ignored. I've updated the post on the site with the new files. Fanpuck, just before I make my final decision... I'm definitely leaning towards the option you suggested but do both platforms include playoff games? The TV package doesn't have any playoffs and the streaming option only has them on the 48 hour delay for blacked out games. All playoff games are aired nationally, so they are all blacked out live. That's what I read and wanted confirmation. I was thinking that maybe it's different for the Habs since I doubt any Habs games would be nationally broadcast in the USA. I guess if CBC or another channel broadcasts it nationally in Canada the same may apply though. Either way, I'm about to purchase what you suggested. Thanks again. What do you usually do for the playoffs? NBC utilizes three channels during the playoffs to air most every game. In addition to the normal NBCSN, they also carry playoff games on USA and CNBC. A handful of games are aired on NHL Network, but only if there are 4 games on at the same time, which only happens a couple times in the first round. As far as I know it is but I haven't received the one for this month yet. Well... 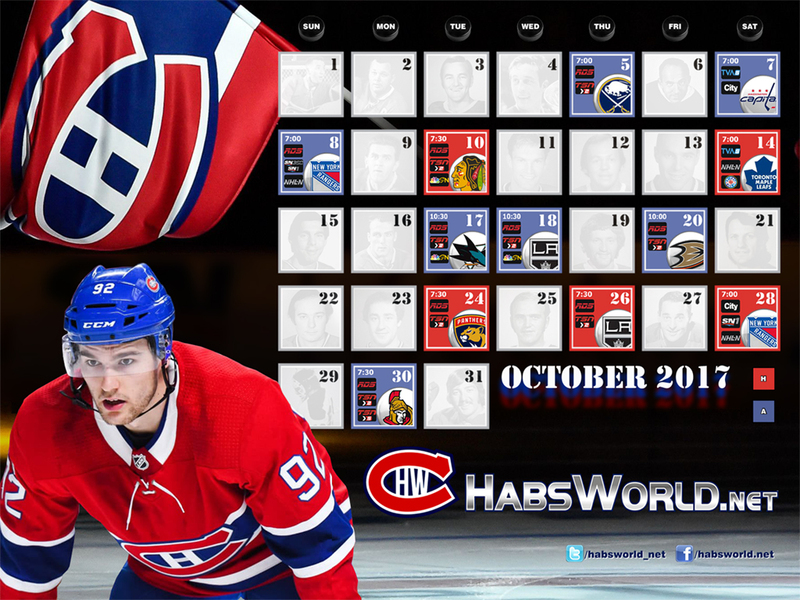 It's November 10th and I see this wallpaper everyday because I use it at work, but I just noticed the détails with all the former Habs faces in the non-games days. WE WANT DECEMBER ! WE WANT DECEMBER ! WE WANT DECEMBER ! Jesperi qu’on va bien jouer pendant le moi d’octobre.